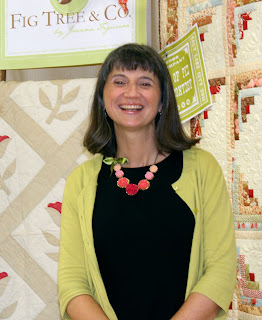 The Fat Quarter Shop is excited to welcome Joanna Figueroa of Fig Tree Quilts to the Jolly Jabber. Joanna’s latest fabric collection is the much anticipated Strawberry Fields from Moda. We featured this collection in our 2011 Designer Mystery Block of the Month program which is now shipping! If you are considering joining this club sign up today as our spots will be sold out soon. Q: What was the first seed that grew into the Strawberry Fields collection? A: Strawberry Fields is my take on a 50’s retro look as I imagine it. The group was inspired by a few of my favorite vintage linens and tablecloths as well as my interpretation of 50’s fashion- especially the skirts. Think colorful poodle skirts with little cardigans in creams, aquas, tomato reds, slate greys and buttery yellows. Ponytails with big gingham bows and summery rides in convertibles. Picnics at the park with rattan picnic baskets and yummy sandwiches on bright, colorful quilts. Lots and lots of polka dots and little feminine prints. Lots of summer and sun and dressing up just for the fun of it. Top it all off with lots of stops at the local soda fountain and there you have it. Strawberry Fields. I think maybe that’s what I would like to be doing this summer!! A: My favorite print in this collection is easily the large floral. I just love the feel of it and how it turned out. If you are going to make me pick just one, I guess I would have to go with the grey one. A: I have always wanted to live in the 50’s- dresswise anyway. There is something about those twirly skirts with crinolines underneath that just feel so girly, free, flirty and fun. I know they probably weren’t that fun but a lot of work to put together from what I have heard but in my imagination, they are the ultimate fun, girly skirt for the summer. I would love to wear some like that out of some of the large florals in this group. Oh, the imagination wanders! I am listening to 80’s tunes right now. They make me feel full of energy and some of the only songs that I still know all the words to. Kind of scary if you think about it. I am using up lots of brain space remembering words to songs that I learned in high school! Chocolate. In any form. But it has to be good chocolate. Dark and preferably with nothing else in it other than maybe orange. I know, its a strange combination but it's my favorite. Dark chocolate and orange. Okay, now I have to go find some. Thanks. Grew up in a small suburb of Warsaw Poland and then in Southern California after that. As an adult, we have lived in the San Francisco Bay Area for most of my married life. Couldn’t really imagine living anywhere else at this point. Except for maybe a little town somewhere in Northern California. We have a spazzy Beagle named Lucy. We had one named Emma for 14 years before we lost her last year. We also have a “carnival” fish that has somehow survived against all odds. It doesn’t have a name. We refer to it as “the fish”. As in “did anyone feed the fish today?” However, at the moment we are contemplating adding chickens to our family. Yup, we are researching that urban farming craze and looking into building a chicken coop in the back yard this summer. You’ll have to check back on the blog to see if we actually go through with it! 8. What is the most important part of a sandwich? The bread. Good bread can make or break any sandwich. In fact, sometimes the bread is enough. Good bread with some butter. Nothing else is necessary.